The Cathedral of Siena is one of the three most important churches in Tuscany. The other two are the Cathedral of Florence and the Cathedral of Pisa with the famous Leaning Tower Pisa. Highlights in the cathedral of Siena are mainly works of art, especially the world-famous pictures on the floor of the church. The Piccolomini Library in the church, the baptistery, the crypt under the cathedral and the museum of the cathedral inspire millions of people every year. 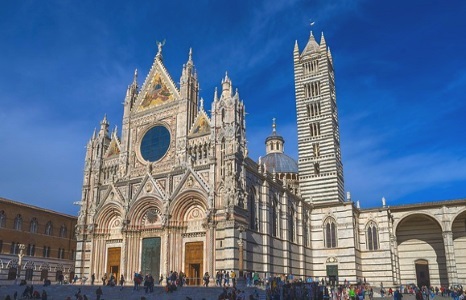 On some large Internet portals, the cathedral in Siena even receives better ratings than the other two large Tuscany churches in Florence and Pisa. The queues at the entrance are also often long at the cathedral in Siena, more than a million visitors come to the church every year. Visiting the church is not free, but the entrance fees (see below) are fair. In principle, there is only one important ticket. It is valid for all sights in the cathedral such as the church itself, the famous library, the baptistery (baptistery), the krypta in the basement, the cathedral museum of Siena and much more. These tickets are valid for 3 consecutive days, so you don’t have to visit everything in one day. These tickets are available on the spot and on the Internet. If you buy the tickets online, you might save a lot of waiting time at the cash desk. At many big sights in Tuscany, there are long queues every day. The ticket price depends on the season. In the summer season, the tickets are more expensive than in the winter. In summer the entrance fee to the cathedral is 15 Euro (as of the beginning of 2018). The tickets on the Internet with quick admission cost 17 euros. More information and booking on the excellent ticket website Getyourguide. The cathedral of Siena can be visited every weekday, so there is no rest day. The following opening hours apply in the season (March to October): daily from 10:30 to 19 o’clock. Exception: On Sundays and holidays the cathedral opens for visitors only at 13:30 and closes already at 18 o’clock, since a service takes place in the morning. Due to church services, the opening hours are sometimes somewhat shortened, for example the cathedral closes one hour earlier in the evenings before some church holidays. Shorter opening hours in winter: In the months November to February the cathedral closes already at 18 o’clock, on Sundays / holidays at 17:30. It is better not to come on Sunday or holidays: Due to the large crowd and the shortened opening hours it is better to come on a weekday than on a weekend (especially not on a Sunday or holiday). The cathedral is of course in the middle of the old town and only a stone’s throw away from the large central square Piazza del Campo. The cathedral „Duomo di Siena“ is in the city center. The other big sight, the square Piazza del Campo, is about 100 meters to the east. The main train station in Siena is unfortunately a little outside the centre, the walking time from the train station Siena to the cathedral is about half an hour. It is best to walk up the long escalators from the station to the city centre (through the shopping centre). The old town of Siena with its cathedral is on a small hill about 100 metres above the station. Siena is not a really big city (about 50.000 inhabitants), most of the big sights can be reached on foot. The cathedral church with the actual name „Cattedrale di Santa Maria Assunta“ is already from the outside a real eye-catcher. We particularly liked the façade with its pattern of light and dark marble. The architectural style of the cathedral of Florence is predominantly Gothic, it comes largely from the 13th century. But many works of art in the interior of the church originate from later epochs. Quite a few are, how could it be otherwise in Tuscany, from the Renaissance period. Floor: Perhaps the most important works of art in southern Tuscany are the more than 50 large mosaic pictures inside the church on the floor, unique in the world! The pictures mainly show scenes from the Bible. Unfortunately, some mosaics are temporarily covered, so as a visitor of the cathedral, you cannot always see all of them. 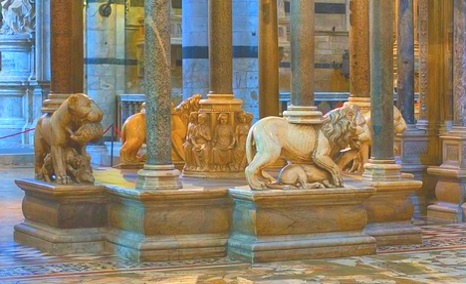 Very important is also the pulpit of Nicola Pisano with the well-known lion figures made of marble (see picture ). Another highlight is the Piccolomini Library. It is a library in the cathedral of Siena (adjoining room) with a collection of old choir books and manuscripts. The ceiling frescoes of Pinturicchio – absolutely worth seeing – are magnificent in the Piccolomini Library. 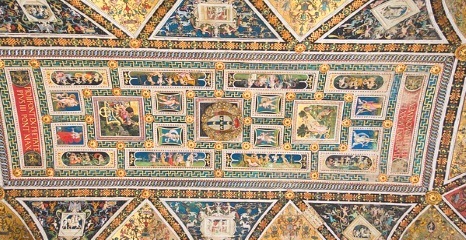 Also some works of art on the ceiling of the cathedral are grandiose. The Baptistery of Siena is not a separate building like the Baptistery of Florence or the Baptistery of Pisa, but part of the Cathedral. Today, however, visitors only enter the Baptistery from the outside (rear entrance of the cathedral). It is a baptistery, in former times children were not allowed to enter the church without being baptized. So they first had to be baptized in a baptistery. Also take a look at the cathedral museum of Siena. Everything is included in one ticket, also the krypta under the cathedral church of Siena, which was discovered only a few years ago, can be seen. The cathedral museum is opposite the cathedral (easy to find), you get into the krypta from the side of the cathedral. All these things are included in the entrance ticket. The so-called Facciatone is also included in the admission price of the cathedral ticket. It is a vantage point on a kind of high balcony opposite the cathedral. You have to go up a long staircase. Altogether the Dom Siena has a lot to offer for visitors. We think it is about as much as the Cathedral of Florence and more than the Cathedral of Pisa. The cathedral Siena is next to the Piazza del Campo a few meters away with the Palazzo Pubblico the most important sight in the southern part of Tuscany. The tickets for the cathedral are valid for all parts of the church and museum. It is better to buy the tickets in advance on the Internet, as the waiting times at the cathedral cash desk are often long. We recommend the website Getyourguide to buy the tickets. Cathedral of Florence with the great dome. Cathedral of Pisa with the famous Leaning Tower. Cathedral Lucca, a beautiful city in Tuscany. St Peters Vatican, the most important church in the world. St Marks Venice, the very famous basilica in Venice.